Order in next 13 hours and 58 minutes for despatch today. E. Jeffries Falcon Running Martingale. E. Jeffries' English made, Falcon range of bridlework is crafted in Walsall, the home of English bridlework. It is made from best bridle leather and stitched in either black or havana thread to match the colour of the leather. The reverse (or flesh side) is also coloured to match the top surface of the leather. The Falcon range is available in havana brown or black. 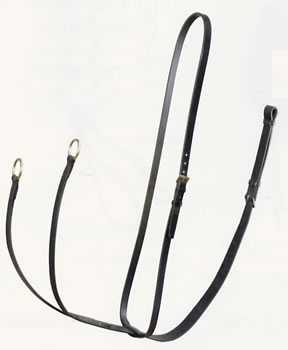 This running martingale is available in; pony, cob, full and extra full sizes. Choose size and colour from pull down menu.